Spicy Peanut Potatoes is a no onion no garlic recipe. Spicy Peanut Potatoes can be used as a fasting recipe too. 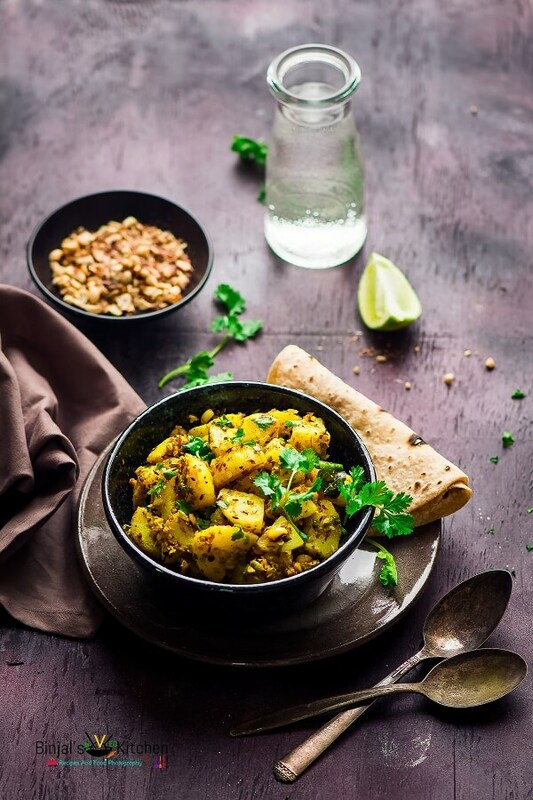 Spicy Peanut Potatoes is a very quick and tasty curry with minimum ingredients. Adding roasted peanuts to the curry is a great way to add a bit of crunch to the curry. 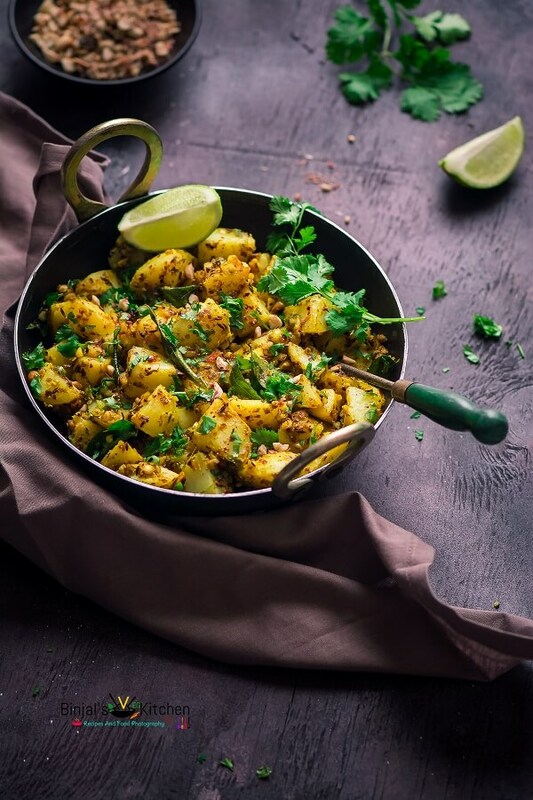 Potato or aloo recipes are always versatile. You can cook potatoes in many ways. Potatoes can be cooked in different flavors, spices and most importantly without onion and garlic. That is why aloo recipes are very good choices for Indian festive fast and Spicy Peanut Potatoes is one of them. It is one of the dish which everyone loves in my family and must in our home when any of the house member is on a fast. 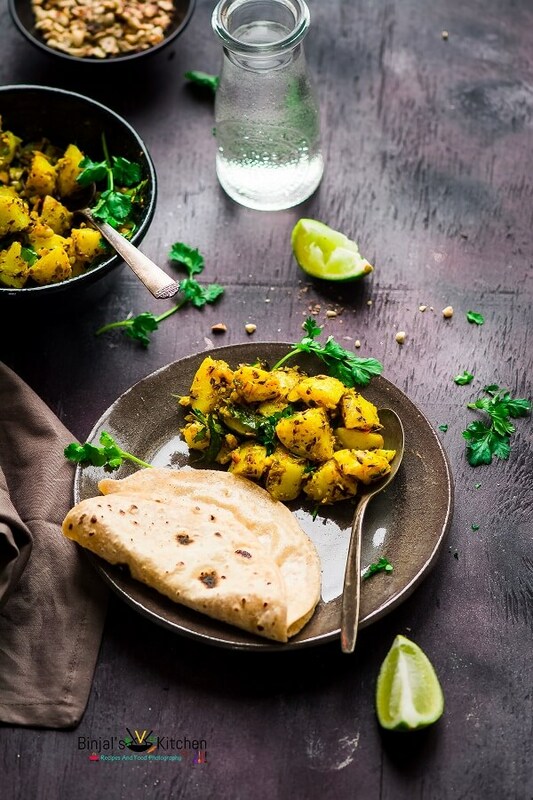 This tasty dry potato curry made during fasting or vrat for Indian festivals such as Navaratri, Maha Shivratri, Ekadashi, Janmashtami, Shravan Maas Upwas, etc…It is also commonly refered as a farali sukhi bhaji in Gujarat. 1. Heat the oil in a kadhai, add cumin seeds and curry leaves, then add crushed green chilies, grated ginger and sauté it for few seconds. 2. Add crushed roasted peanuts and again stir fry it for a minute. 3. Add chopped coriander leaves, turmeric powder, salt and mix it. 4. Add boiled cubed potatoes, lemon juice, sugar and mix it very well. 5. Cover it and cook it for 1-2 mins. 6. Spicy Peanut Potatoes are ready. Garnish it with some coriander leaves and serve with roti or dal rice or just serve simply with yogurt and enjoy. • You can have this while on Indian fasting. • Do not use over boiled potatoes else it can make mushy mixture not like dry curry. • You can add chilies and ginger as per your taste. Heat the oil in a kadhai, add cumin seeds and curry leaves, then add crushed green chilies, grated ginger and sauté it for few seconds. Add crushed roasted peanuts and again stir fry it for a minute. Add chopped coriander leaves, turmeric powder, salt and mix it. Add boiled cubed potatoes, lemon juice, sugar and mix it very well. Cover it and cook it for 1-2 mins. Spicy Peanut Potatoes are ready. Garnish it with some coriander leaves and serve with roti or dal rice or just serve simply with yogurt and enjoy.